As anyone who’s ever cheated on a diet, bought an overpriced meal, or voted in an election can tell you, most of our decisions aren’t rational; they’re emotional. Dan Ariely, a behavioral economist at Duke University, knows this all too well. His new book The Upside of Irrationality, takes a close look at the many factors that motivate irrational decisions. The book is chock full of eye-opening insights into human behavior. Perhaps my favorite is something called “The IKEA Effect.” According to this idea, people overvalue the things that they helped to make. That IKEA coffee table you put together might not be worth as much as fine-crafted furniture, but it’s just as valuable to you. According to Ariely, when instant cake mix was introduced in the 1950s, it wasn’t a popular product. Many housewives found the cooking process to be too easy. It wasn’t until Pillsbury began selling mix that required the home cook to add fresh eggs, milk, and oil that sales took off. This is truly irrational. Why would a consumer prefer a product that made baking more labor-intensive? I realized when I read this that, with the IKEA Effect, Ariely has struck upon one of the key ideas driving our Participation Economy. Enabling consumers to participate in the creation of a product – whether it be sweetening their own drink at Starbucks or designing their own pair of Converse sneakers – is a way of making that product matter on an emotional level. Only when a product engages a consumer and becomes a valuable part of that person’s life can it inspire loyalty beyond reason. IKEA may not be the furniture store that provides the best furniture for the lowest price, but it has become the world’s largest home furniture retailer nonetheless. Like any successful company in the Participation Economy, IKEA’s secret is that it has found a way to forge an emotional connection with its customers. 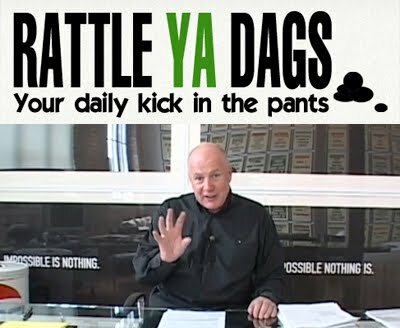 In 2010 a website Rattle Ya Dags launched to give “a daily dose of inspiration” to New Zealanders. The name is a colloquialism for “hurry up” (and if you really want to know… the saying developed because when the wool around a sheep’s backside crusts into dags, it makes a rattling sound when they run). The site is a place for down-to-earth advice and motivation in bite-sized videos. It’s a fun and well-executed idea featuring over 100 New Zealanders from sport, business, politics, art, and entertainment. Rattle Ya Dags have cut three videos from an interview I did earlier in the year, the most recent about the advantages of coming from an edge culture, and why it’s better to fail fast/ learn fast/ fix fast, than to be a perfectionist. 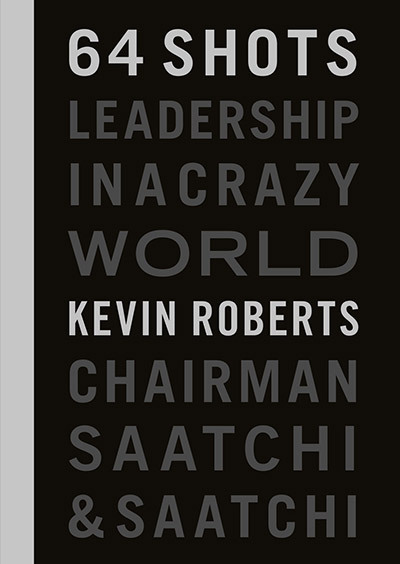 Previously, I proposed three questions which are key to finding your personal purpose, and spoke about leading Saatchi & Saatchi Worldwide (Nothing Is Impossible). Good on Two Heads and NZ On Air. Wisdom I like comes from Paula Bennett (Move On), Annah Stretton (Have a mentor), Tina Cross (Listen to your kids) and especially Jon Trimmer (Ignore them). Everyone with even a passing interest in football will have been enjoying this World Cup, where reputations have been turned on their head. France and Italy imploded; England are out, as is USA; African teams haven’t enjoyed the continental bounce they might have expected – but go Ghana! ; Maradona is busy growing up as a manager/motivator. And my hometown team, the All Whites from New Zealand, have had an inspirational run which saw them unbeaten and unbowed. Coach Ricki Herbert planned every game meticulously, and inspired the team to play at peak. Who could ask for more? It was only our second appearance at a World Cup, the first being back in 1982. In that World Cup we lost all three in a group that included Brazil and the Soviet Union. This time, we didn’t lose a single game, holding the 2006 World Champions Italy to a famous draw, which we also did with quality teams from Slovakia and Paraguay. For a country with only 25 professional footballers, that’s some achievement. I served for a time on the board of NZ Soccer and the key decision our CEO Graham Seatter and Chairman John Morris drove during my term was appointing Ricki as the coach. He is a good man and is due immense credit for marshalling his limited resources so well. The captain Ryan Nelsen was a true inspiration. He organized the defence superbly, and drew the best out of his team-mates. Tommy Smith had an excellent tournament, Mark Paston was immense in goal. They kept out celebrated world-class attacking players such as Roque Santa Cruz, Alberto Gilardino and Marek Hamsik. Shane Smeltz and Rory Fallon worked hard up front and although we couldn’t score many, we didn’t let many in either. Our next step is to develop our midfield and attacking talent (Chris Wood looks promising), and make the next World Cup even more special. The New York Times called our team ethic one of “rock-solid collective gut”. Our team was a family, and in just a few weeks it turned into a family of five million – New Zealand United. It felt great. None of us is as strong as all of us. Bring on Brazil in 2014. In order to thrive in a Participation Economy, traditional media outlets like newspapers and magazines will need transformational ideas. Especially when it comes to creating revenue in an age of free content. Of all companies, Starbucks might have happened upon just such an idea. Next month, the coffee giant will begin offering free wi-fi in all of its American locations. No big deal in this – but soon, Starbucks customers will also have unrestricted access to a variety of pay sites, including the Wall Street Journal. This is an innovative way of avoiding the dreaded “pay wall,” without giving content away gratis. Publishers get paid for their content, Starbucks gets to offer an exclusive service that will surely help sell more coffee, and customers save potentially hundreds of dollars in subscription fees. As we’ve seen, the emergence of the Participation Economy has been both good and bad for the media industry. Today, anyone with an internet connection can access a wide array of content – from the Washington Post to their friend’s latest blog post, from the Drudge Report to the Colbert Report – and decide for themselves what’s worth their time. In fact, only 7 percent of Americans get their news from a single platform. At the same time, technologies like blogs, Facebook, and Twitter allow every connected person to create, distribute, and comment on media without getting out of their pajamas. Media of all forms has never been more engagingly diverse. But traditional media outlets, as we know, are in the lurch. The truth is, one way or another, high-quality content will need to be paid for. Figuring out how to do that, without disrupting the dynamic media environment that free content has created, will require wild experimentation. If content producers are going to discover the breakthrough ideas that will keep mainstream media thriving for years to come, they need to adopt a philosophy of fail fast, learn fast, and fix fast. Of all the stories sent to Lovemarks.com over the past few weeks, these two were the most emotionally compelling (not to mention the most tangential!). Lovemarks was launched in Russia in 2006 -- talk about a country full of mystery, sensuality, and intimacy. Andrei Voznesensky was a poet who filled stadiums. This one is for the writers among us. Thanks Anita and Elizabeth! When I first read Vogue and an article on the Russian poet Voznesensky I immediately read Anti Worlds and realized what a monumental breakthrough the book was for the sheer reactions of the poet's perceptions to his surrounding world. His transposition of imaginative themes into colorfully pragmatic ones was without parallel. Voz furnished by analogy a table of multiple equivalents in poetic perceptions and verse. This verse was the most unusual written in the twentieth century that had any cohesion. Andrei was a progressive thinker and came often to various places in the world where he would recite his poetry to packed auditoriums and halls. His turtleneck sweater became immortalized as he established his new aesthetic era. His poetry is progressive and provocative and he left the world alone earlier this month in his beloved Moscow without fanfare. Only the echo of his spoken dithyramb lives on forever. Andrei Voznesenky underscores the rise of subjective and free poetry that left the residuals of his often experimental poetry in the souls of his readers. Andrei Voznesensky was the greatest of poets because he taught us that Poetry never lies. For this he is a Lovemark who also taught us that without force but with his fountain pen the world can be transformed. May that final journey be as wonderful as your colorful life. Many kind thanks. High-end hotels often capture attention by their collaborations with artists and a daring approach to design. For guests, it’s an escape to a dramatic world far removed from the mundane details of daily life. I haven’t seen any hotel design so daring, though, as a recent pop-up in Rome which is created entirely out of one of life’s least glamorous aspects – garbage. Created by German artist HA Schult, the five-room Save The Beach hotel was erected for World Environment Day on 5 June. It’s made of a whopping 12 tonnes of rubbish – all of it collected from European beaches. Schult has been working with waste materials for over forty years, and his legions of “Trash People”, arranged in formation around famous landmarks, are an incredible spectacle. He summed up the background of the project neatly: “The philosophy of this hotel is to expose the damage we are causing to the sea and the coastline…We live in the era of trash and we are running the risk of becoming trash ourselves.” You can see photos of the hotel, (and its first guest Helena Christiansen!) on the Save The Beach Facebook page. It reminds me of a campaign Saatchi & Saatchi LA did a few years ago for the Surfrider Foundation, an organization dedicated to protecting oceans and beaches. To engage people with the far-reaching consequences of pollution, trash was collected from beaches and packaged up as “Catch of the Day” style seafood, displayed in farmers’ markets. It’s not often the sense of taste is evoked in sustainability communications, and just looking at stills from the campaign gives a strong gag-and-gut reaction, prompting seafood lovers to think about the environment their fish dinners come from. If you’ve been watching the FIFA World Cup (as I certainly have), you’ve seen yet another imaginative effort to put trash to good use. Nine teams, including New Zealand and the United States, are wearing jerseys made entirely out of recycled plastic bottles. Nike converted 13 million bottles from landfills in Japan and Taiwan into the polyester thread that was used to weave these jerseys. In the process, they reduced their energy consumption by 30 percent! Here’s to clean beaches and oceans, to wasting less, recycling more, and to committing to Do One Thing – the simple act of picking up after ourselves. My enthusiasm for the iPod and iPad has been well documented here. I’ve also been saying “No Sustainability – No Lovemarks.” For me, Sustainability encompasses economic, social, cultural and environmental dimensions. Therefore I’m duty-bound to pay close attention to the stories about the suicides this year by workers in the Foxconn factory in Shenzhen, China where many Apple products are assembled (as well as Dell, HP, Sony). The working conditions at this facility are not sustainable, to say the least. 12-hour days for weeks on end; wages of $130 a month (in the wake of this controversy, Foxconn has increased salaries by 66%); mind-numbing boredom on and off the assembly lines. When this story broke, Apple handled the issue with kid gloves. Steve Jobs deflected questions about the deaths by pointing out that the suicide rate in the Foxconn factory “is under what the US rate is.” Be that as it may, the conditions of this factory seem to contradict the core ideas of human flourishing and global responsibility that Apple has long championed and consumers have embraced. Ensuring that factory workers are treated well must be core to Apple’s commitment to sustainability. The iPad, for instance, is made of recyclable materials and is free of mercury and arsenic. But it’s not enough for Apple products to be environmentally friendly, they have to be human friendly! It’s a perfect example of how the “green” movement falls short, and why the age of “true blue” is upon us. Sustainability isn’t just about the environment, it’s also about the people who live in the environment. In a “true blue” world, innovative ideas are harnessed to create enterprises that benefit the planet, the people, and the purse. If Apple doesn’t embrace a “true blue” philosophy, the company could lose the respect of even its most loyal devotees. Without respect, Apple would become what no company wants to be: just another brand. Despite his disengaged reaction to the news, I believe that Steve Jobs will find a way to emerge from the Foxconn controversy stronger than ever. Meanwhile, we as consumers should be willing to pay a premium to ensure that products are produced humanely. Especially products like the ones Apple makes, which deliver the kind of “priceless value” that have made the company one of the most cherished Lovemarks on the planet. “How can one bookshop be different than the others? Go to Kinokuniya and you will see. Kinokuniya source interesting and thoughtful books about great topics that help us live a more educated and insightful life.” Brenda, United Arab Emirates. In the post that caught my eye, Ben puts forward something he calls “The Age of Early Self-Conception.” It’s his name for something that could also be called “The Facebook Effect,” and asks the question – how is social networking affecting the way we see ourselves? It’s an interesting question. I’ve talked a lot here about the Participation Economy and the interconnectedness of the world, and I think that Ben’s looking at those themes from a totally out-of-the-ordinary perspective. Yes, we are all actively participating in the digital world (the majority of us anyway). Now that we’ve said that, what does it mean for the kids who are growing up in that world? Imagine the tens of millions of 15 year-olds who go to set up their profile and see a big white text box that says "Bio." As the cursor blinks, they ask themselves, "What is my biography? What are my interests? What are my religious views? What is my relationship status? Am I sexually interested in men or women?" Actively defining yourself isn’t something many of us were asked to do before social networks came around. Sure, most people participate in a Federal census, but they don’t ask for much information in those. Giving people of all ages (yes, even grown-ups are on Facebook these days) the chance to publish a definitive biography, even if it’s a one-paragraph version, would be an interesting experiment on it’s own. But seeing how it affects Gen Y’s view of themselves in the long-term is where things will get really interesting. This space-age pan-Asian restaurant combines technology and participation in an amazing way. The top of each table is an interactive touch screen that allows you to alter the look and feel of your space. Add that to the menu that beams images of the food onto your blank plate as you scan through and we’re talking about something Tom Hanks would be really impressed with. This is another New York restaurant that’s taking diner participation to all new levels. Not only do customers order online before they go, but you also get to design what you want to eat. It’s like staying in to cook, minus the leg work. every customized burger they sell. On the other side of the food & beverage world, Coke is doing some really inventive things to push their brand into the Participation Economy. Most notably, the Coke Freestyle – a reinvention of the soda fountain and a brilliant new way to sell their product in the public space. It’s a fact that Coke is a Lovemark, and it’s products like this that keep them there. When these things start getting rolled out in a wider area, watch the iPhone videos come rolling in. A company called sapient has created a new type of vending machine that takes full advantage of the wonders of touch screens. It’s a fully-immersive example of Internet meets shopping mall, and it’s the next big thing. It’s OK to Play with your Food. People don’t just have a Facebook anymore; they’ve also got a LinkedIn, Flickr, YouTube and Twitter. We’re using the web to interact with one another at an almost constant rate, and the impact of that is so big we’re all still trying to work it out. As every industry is trying to figure out how to make the social networking craze work for their businesses, it seems that some restaurants and food brands have taken the notion of participation to such crazy places they just might work. We all live in the Participation Economy, and if you’re not taking advantage of peoples’ need to be actively involved in every aspect of their lives – you’re missing the boat. Tomorrow I’ll be posting some of the coolest things I’ve seen in the food world that are really ahead of the game. Well, I’m a couple of weeks in now and have been traveling through Mexico, Brazil and Argentina speaking to lots of ambitious young managers who are keen to go out there and make a difference. One day in Mexico City saw four major speeches to around 2,000 people including a great session at the Anáhuac University where it was great to see so much enthusiasm and energy from Mexico’s new generation. During all this travel I was suffering from a bulging disc in my back and was trying to avoid, therefore, carrying my normal 12 kilos of files, books, etc. The iPad became my sole recreational vehicle and I have been completely captured (and captivated). It is absolutely clear to me where the iPad fits in my repertoire. It is a FF – fun and family. The only contacts I have stored are family contacts. The only emails I send and receive are from family. I read the NZ Herald and the UK Times every day on the iPad and have downloaded all my favorite Quentin Tarantino, Steve McQueen, and Sergio Leone movies. I’ve added great concert performances from The Boss, Cher, Bob Dylan, and Leonard Cohen and have got around 4,000 tracks transferred from my own iPod. The touch screen is a delight; the graphics are sensational and it’s become a road warrior’s favorite. Fun and Family! How about this for a view of the future? According to scientist and author, Matt Ridley, this is what we can expect from the future based on a reasonable reading of human progress starting with the Stone Age. Radical optimism? Yep and rational too. This is the world-view laid out in Dr Ridley's powerful new book, The Rational Optimist: How Prosperity Evolves. This is refreshing stuff, especially in the midst of the economic and ecological turmoil all around us. Dr Ridley's case is grounded in an astute assessment of the past, and he believes pessimists take the wrong lessons from history. By excavating the past for solutions to the catalog of catastrophic threats that confront us – oil spills, financial meltdowns, climate change – the pessimist despairs when they can't find any. But to Ridley and optimists like me, this misses the glaringly obvious: that, in his words, "the human race has become a collective problem-solving machine which solves problems by changing its ways". As Mark Twain says, "history doesn't repeat but it does rhyme" – and the tune is innovation. In this grand narrative arc, trade between the first humans began the process of creativity and advancement that hasn't stopped since and, despite the naysayers, Dr Ridley projects further acceleration. "The modern world is a history of ideas meeting, mixing, mating and mutating...And the reason that economic growth has accelerated so in the past two centuries is down to the fact that ideas have been mixing more than ever before." It's an awe-inspiring thesis. The more connections between people, the better; the more free and freewheeling the trade in ideas and insights, the more powerful the solutions will become. And ideas rule! We are not just equipped as a species to survive, but to prosper. When it comes to optimism, the rational and the radical are one and the same. This Saturday marks the official start of the FIFA 2010 World Cup in South Africa, and the advertising world has been hard at work working soccer fans into a fever pitch and inserting their products into the mix. Thankfully, a lot of the ads this year have been superb. From the much-hyped, celebrity-stuffed Nike ad, and a genius bit of a history lesson from Coke, to an inspiring team talk for the Three Lions from Carlsberg, there’s been absolutely no shortage on creativity this time around. Here are eight of my favorite World Cup spots from around the world. Perhaps none of the national teams have as rich a world cup history as the Brazilians. This ad for Nike focuses on the almost religious level of superstition and commitment surrounding the beautiful game there. The six minute spot gives us the origin of the Brazilian Blue team shirt, as well as a mythical look at Maicon, Fabiano and Robinho’s childhoods. 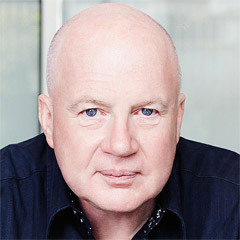 From NAZCA/Saatchi & Saatchi. CD’s - Fabio Fernandes / Eduardo Lima. Guinness - PoemThis is actually a Guinness ad made by Saatchi & Saatchi Cape Town a few years back that proposes – “one day, one day soon – an African team will win the World Cup. The 2010 tournament answer is “halfway there.” CD – Eric Frank. In the Participation Economy, we’re all connected. Our days are centered around social media, email, text messages, Blackberries, iPhones and e-Readers. Facebook and LinkedIn have become such a big part of our lives that they’re almost irreplaceable. We’re so interconnected, that even the smallest decisions are made by a collective We, rather than the individual. Want to go to a new restaurant? There’s a thousand reviews on Yelp that can tell you where to go. Thinking about a new haircut? Post a status update on your Facebook about it and watch the advice come barreling in. With all this interaction, it wasn’t much of a surprise to read a recent Wall Street Journal article – The Power of a Gentle Nudge. The story focuses on a Stanford University study on the impact of social support from friends on exercise routines. And it’s a great idea! Why not use all this interconnectivity to keep yourself (and your friends) motivated? We all know the story; a New Year’s resolution or a less-than great trip to the doctor inspires a new work out regimen. A brisk run every day, drink more water, eat less junk, sleep more, drink less. You’re starting on the path to the new and healthier YOU. Unfortunately, we also know how the scenario ends. You miss a run because you’re late to work or you’re stuck in a meeting or maybe you have to pick up the kids from school. Tomorrow is Friday, so you think – “well, I’ll just take the rest of the week off . . . I’ve earned it.” Monday rolls around and you’re exhausted from the start of the work week . . . and on and on and on. That’s right, not even half of us are meeting the bare minimum of exercise recommended. It’s no wonder obesity is such an issue in America! Sure, fast food is a big culprit . . . but getting out and walking 30 minutes a day could be a huge help. The good news is that a little social nudging can go a long way. were exercising, as a mean, about 178 minutes a week, above government recommendations for 150 minutes . . . Exercise levels for the group receiving computerized calls doubled to 157 minutes a week. A control group of participants, who received no phone calls, exercised 118 minutes a week, up 28% from the study’s start. Even better, other recent studies have found that once the average person sticks to an exercise routine for eight weeks, they can settle into a long-term habit of working out. The next time you’re inspired to slip on your trainers, make sure you tell your Facebook friends to nudge you along the way. By his own estimate, Thomas Edison tested 3000 theories for electric light before he came up with one that worked. It was this epic perseverance that led him to famously observe, “genius is 99 percent perspiration and one percent inspiration.” It is tempting to believe that this means tireless dedication can bring anyone to within a single percentage point of genius, but, alas, this misses the point. What Edison really meant is that, while brilliance doesn’t go far without hard work, brilliance is nonetheless the vital magic ingredient. The solitary miraculous percentage point is really what changes the world, as Edison’s amazing life attests. Moments of Genius is a series of six interviews running on bigthink.com. The interviews with a range of modern-day Edisons delve into the back stories of great discoveries and earth-shattering insights, and tease out the elusive eureka moments. Another interview subject is David Ho, the man most responsible for the successful treatment of HIV-AIDS over the past 15 years. His background in mathematics and physics allowed him to develop the cocktail treatments that beat the virus at its own game, and save millions of lives. What stands out from all of the interviews is that breakthrough innovation rarely emerges from committee. It is far more likely to be the handiwork of individuals or small, united teams who are unashamedly obsessed with solving a problem and simply won’t stop until they crack it. Unconventional, unpredictable, fiercely individualistic – there are the inventors, innovators and problem-solvers that change the world. In the face of complex challenges like oil spills and climate change, people wonder whether human society has met a point at which the scale and complexity of problems have out-paced our ability to innovate our way out of them. As long as Edison’s one-percent rule persists – and as long as great minds like Kleinrock, Ho and others refuse to take no for an answer – then radical optimism is surely the most rational state of mind. I went out last week to my favorite London restaurant. Corrigan’s in Mayfair. Richard Corrigan is a terrific Irish chef who produces that rarity; top class English food. We had some local oysters followed by some great Dressed Crab from Dorset and an amazing Steak and Kidney Pie. Topped off, of course, by Rice Pudding. English comfort at the highest order. A couple of weeks back I went there with youngest son Dan and sat at the bar all night where we ate. Richard’s staff is full of ex-Waterside Inn pros including Maître d’, Frederique – a star. And the wine list has some of the finest Bordeaux. Dinner last week was with two crazy Italians, Giuseppe Caiazza and Domenico Siniscalco. Giuseppe cut his teeth at Club Med, Ford and Toyota and is now going to Milan to run Saatchi & Saatchi. Domenico is an incredible guy who has had three careers. A leading academic at Cambridge, the Minister of Finance for Italy for five years, and now a banker with Morgan Stanley. The three of us are in different decades in age terms and I had just read a great article from Tony Parsons talking about the various decades of man. Discussion ranged over 2001 Chateau Haut Brion and we concluded that Tony was pretty much on the button. What do you think? At ten years old he wants to be tough. At twenty he wants to be cool. At 30 he wants to be free. At 40 he wants to belong. At 50 he wants to be fit. At 60 he wants to be rich. At 70 he wants to be healthy. At 80 he wants to be alive. When all else fails, try being good. So starts New York Magazine’s excellent feature this month on why American television is better than it’s been in ages. In a world where American Idol, Survivor and Dancing with the Stars are used to being the center of attention, smaller shows like Mad Men, Breaking Bad, It’s Always Sunny in Philadelphia, and 30 Rock are changing the way Americans look at TV. The Economist report I shared yesterday talks about why television isn’t going anywhere. This NY Magazine piece talks about why some of the most memorable, well produced, well acted and ambitious television shows in history have popped up in the past three years. The report tosses around a lot of ideas, settling on a simple, direct concept – that we’re tired of watching crap. Like almost any commercial product, it lives somewhere on the axis between commerce and art. And right now it’s more about art than commerce. So does that mean that TV is dying? No! It means it’s changing. Now advertisers are flocking to shows that draw big numbers from their target audience. If you want to sell something to college educated men in their early 20’s – you go to The Daily Show. If you’re a teen clothing line, you might want to think about Project Runway. The point is, you don’t need to be huge to earn a second season, you just need to be a great show that appeals to a niche market. 1 million viewers is a lot ... if they are the right type of viewer. Lowered expectations financially allow higher expectations creatively. I was in my 20’s during the 1970’s, and it seemed like every weekend a new film hit the theaters that was going to blow your mind. The film industry was on the brink. They were out of touch with reality, blowing money on big budget flicks that flopped left and right. And what saved the day? Hiring a bunch of young nobodies to make films that people could actually get in touch with emotionally. Guys like Francis Ford Coppola, Steven Spielberg and Martin Scorsese came along and made movies that weren’t just brilliant – people actually went out to see them in droves. Today the film industry is back to big budget blockbusters, and films like The Godfather and Harold and Maude couldn’t get made today. Thanks to the shift to niche marketing, TV producers can afford to experiment with creative, inventive new concepts. What does that freedom mean for creatives? Instead of going into film, the Gen Y Spielbergs and Coppolas are popping up in TV land. And with the influx of creativity comes not just consistently better writing, but also better acting and cinematography. I would never have guessed when I watched The Godfather for the first time that in thirty years I’d be turning to TV for such high quality Sisomo, but that’s exactly what’s happened. I mean, I like a good Hollywood explosion as much as the next guy, but it’s the beautifully shot desert landscapes of Breaking Bad that take me back to the 70’s, not the recent Bruckheimer blow-em-up. TV is mass enough to be commercially viable and narrow enough to allow some creators to give free rein to their once-repressed geekery. That means networks can take a chance on shows that we wouldn’t have dreamed of seeing on TV even five years ago. To highlight just how creative TV has gotten, I’ll leave you with a few of my favorite (bizarre) premises for current shows. I would have loved to been in the room when these were pitched.